The Bravehearts visit your senior center or school to launch the program. We provide the journals, topics, and we match you with your pen pal. We'll pick up the journals each month and shuttle them to your pen pal so that he or she can write a letter back to you. When they're finished writing, we'll bring them right back to you. 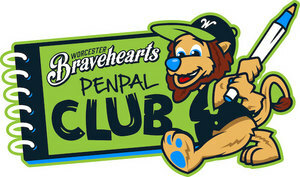 In June, your classroom or senior center gets a free trip to Hanover Insurance Park at Fitton Field complete with a game ticket and lunch so that you can finally meet your pen pal! The only thing you provide is the transportation. The 2019 Pen Pal Field Trip dates are June 5th and June 6th at 10:30 AM.